Lock in a great price for Villa Caemilla Beach Boutique Hotel – rated 9.2 by recent guests! Absolutely exceeded my expectation - luxury. Great sized, comfortable rooms, with daily notes and homemade treats left with evening turndowns. Manager left a note and a little gift on my final night to thank me for staying with them. The restaurant food and drinks are fantastic with the most beautiful view of the beach. The sunsets were insane. Staff are amazing - so helpful and friendly and greeting you constantly. Located in station 3 so lovely and chilled at night with a few restaurants and bars around (short walk from other stations) and right next to the station 3 activity meet up point for scuba/parasailing/snorkelling etc - everything there on the doorstep. Excellent stay. Staff amazingly polite, warm and fun! Room was clean, bed was comfortable. The quality of the cocktails (especially the Gin Tonics) is really good. Live music during the evening was pretty good. Location unbeatable!!! Thanks to everyone at Villa Caemilla for making our stay excellent! Great location. Clean, beautiful hotel. I think the best on White Beach. Room was big. AC worked great. Food was good. Staff was nice and always going above and beyond to support. Location was great: away from the busy part of the beach. That was certainly one of the best holidays we had. The location of the hotel is great. We could easily walk to any restaurant we wanted. Besides, it was on a very peaceful location, which we could enjoy the sea and the sun away from the crowd of tourists. The food, the cleanliness, the service at the hotel was excellent. And the best thing about the hotel was the personnel, both helpful and smiling all the time. Impeccable service, delicious food, luxurious but cozy room. We loved the service, location and amenities. Everyone was really lovely and helpful. The food and drinks were excellent. The room was really nice with a comfortable bed. The access to the beach is just few steps from the front of the building and the beach is much more peaceful than the rest of the strip. 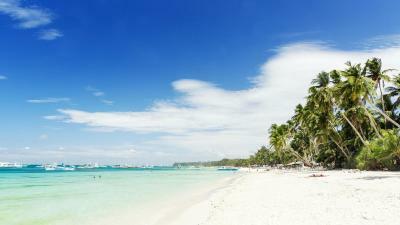 I would definitely stay here again if I came back to Boracay! They asked us to participate on a painting activity. I couldn’t believe i can paint. The instructor was great and the activity is between 2-4 pm whiich normally i would take an afternoon nap. The painting was a worthwhile activity. Villa Caemilla Beach Boutique Hotel This rating is a reflection of how the property compares to the industry standard when it comes to price, facilities and services available. It's based on a self-evaluation by the property. Use this rating to help choose your stay! 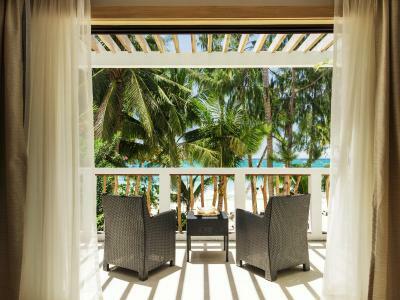 This elegant resort is within 0.8 mi from D’Mall Boracay. 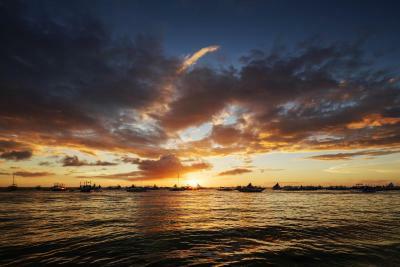 Caticlan Jetty Port is a 15-minute boat ride away while Kalibo International Airport is approximately a 1.5-hour drive away. 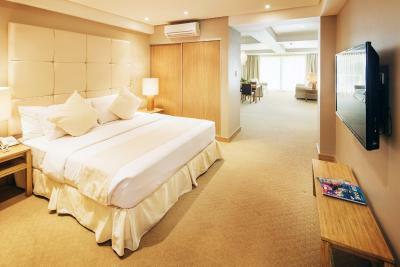 Decorated in soothing shades, air-conditioned rooms will provide a flat-screen TV, mini-fridge and seating area. The private bathrooms come with plush towels and free toiletries. 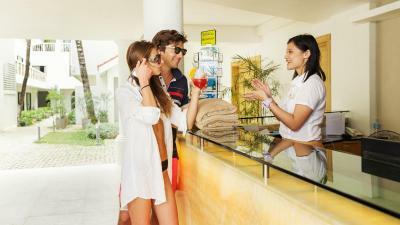 At Villa Caemilla Beach Boutique Hotel, facilities include a 24-hour front desk and activity desk. For convenience, airport shuttle services are available at a surcharge. A variety of local and international cuisines can be enjoyed at Villa Caemilla Restaurant. For alternative dining options, room service is available. 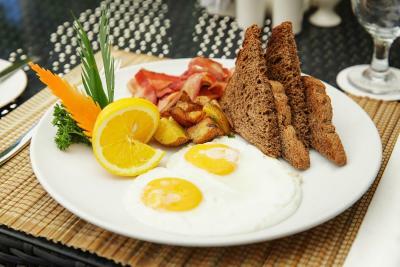 A la carte breakfast meals can also be ordered any time of the day. 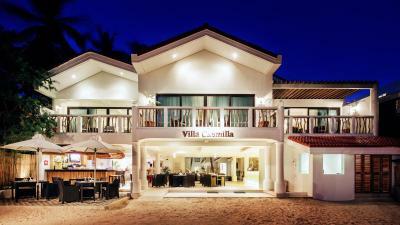 When would you like to stay at Villa Caemilla Beach Boutique Hotel? Cooled with air conditioning, this large room features a queen bed, flat-screen TV, sitting area, work space and a private bathroom. Cooled with air conditioning, this large suite features a king bed, flat-screen TV, sitting area, work space and a private bathroom with a bathtub. Overlooking the ocean, the suite features a plush sofa which can be turned into a sofa-bed that fits 2 people. Cooled with air conditioning, this room features a queen bed, flat-screen TV, sitting area, work space and a private bathroom. This suite features a plush sofa which can be turned into a sofa-bed that fits 2 people. Cooled with air conditioning, this spacious suite features a king-size bed, flat-screen TV, seating area, work space and a private bathroom with bathtub. 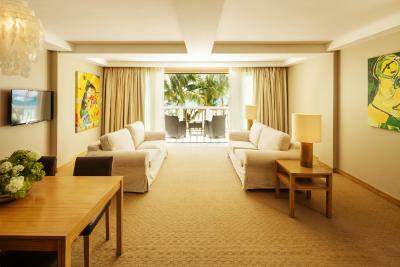 Overlooking the ocean, suite features 2 sofas which can be turned into a sofa-bed that fits 2 people. Cooled with air conditioning, this large room features a king bed, flat-screen TV, sitting area, work space and a private bathroom. This room features a plush sofa which can be turned into a sofa-bed that fits 2 people. If you’re looking for the best beachfront hotel in Boracay, Villa Caemilla is located in the prime spot of Station 3, right on the world-famous White Beach. House Rules Villa Caemilla Beach Boutique Hotel takes special requests – add in the next step! Villa Caemilla Beach Boutique Hotel accepts these cards and reserves the right to temporarily hold an amount prior to arrival. Please inform Villa Caemilla Beach Boutique Hotel of your expected arrival time in advance. You can use the Special Requests box when booking, or contact the property directly using the contact details in your confirmation. The rate of above $200 a night is just little expensive for a boutique hotel. Also wifi connection is a problem. Door locks in the room and room toilet seem pretty rusty too. Very chill vibe, away from the crowds. Food in the restaurant is also made with quality ingredients! Beach is right in front, with towels and mats provided. Staff are friendly and helpful. Room is also very comfortable. It did advertise that they had a spa but when I arrived found out it was located a few businesses away (very short walk). I had a great massage and treatment but it was not in any way affiliated with the hotel. The view is magnificant, the beach is lovely. In the afternoon and start of the evening there is easy listening music/performer. People are lovely. It’s the quit part and in a walk of 10 minutes you are on the bussy side of the beach. The food in the restaurant could be better or cheaper . We only left today and I miss Villa Camilla already! Such a gorgeous little hotel and the best location on Boracay. Excellent food and drinks and phenomenal staff. Would highly recommend. It is at the very south of the strip and really is so much nicer than the busier part. If you want to chill out and enjoy a relaxing holiday this place is just lovely from the minute you check in and they hand you a welcome drink, freezing towel and a shell necklace to check out. Would love to go back. The only 2 minor things were that the service in the restaurant could be very slow, but then again it's a super relaxed island so I can't really complain. The second was that our room was facing the back of the property and had hardly any natural light getting in, as well as the fact there was some sort of generator or something that was loud for a couple of hours during some of the mornings. This hotel is absolutely amazing! We loved everything about it. 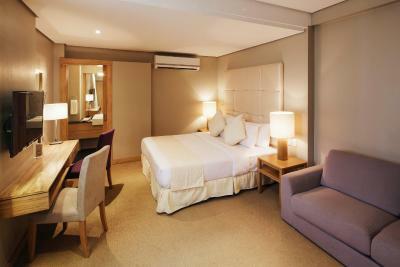 The rooms were clean and comfortable with good toiletries, fresh, fluffy towels and lots of small nice touches. The restaurant area had the best view of the beach, especially for sunset. The food is great too, as are the cocktails. The staff were so friendly and always willing to help. The hotel is about a 15 minutes walk to the main area of bars/restaurants (station 2), but this was never a problem as it meant the beach by the hotel was always peaceful and we weren't kept awake by loud music. I will 100% be returning here. Food quality was not the same. We ordered the same food different day and taste different. The room and mattress was really comfortable. Free water bottle while you stay. the chef does not know how to cook eggs Benedict, so it’s better not to order them for breakfast. Great beach hotel! Located in my opinion in the best part of the white beach, 30 meters from the sea. Very friendly and helpful staff. The guys in the restaurant, the bar work hard from early morning until late evening and do their job well. The rooms are very comfortable, except for the rooms of the lowest category, which have small windows that do not let in much sunlight. At the same time, the hotel has a cozy restaurant area and is located right on the beach, so being in the room is kept to a minimum. The hotel helped our large company in organizing a transfer from the airport, which made our life much easier! We booked the transportation service back from the hotel to Boracay airport , even though we payed at the hotel, we still had to pay a $ 100 PHP/person fee which were not informed. Best service ever! Amazing place!